It has been a whirlwind month! Andrew and I finished up our first ever back-to-back Email and Facebook Intensive here in Austin, TX. Both Intensives were wildly successful and we’ve been spending this week reflecting a bit. As much as these Intensives are focused on sharing what we know, we also learn a ton from each business who attends. In this episode, we share our discoveries from the event with you. We unpack an unusual success story from Facebook Messenger, discuss how to use the new Visual Flow Builder in Klaviyo, and key in on a powerful use case for the Gleam platform. We also share a few surprises from the Intensives. Successful marketing campaigns come in many different forms and working with almost 40 businesses over a 4-day period reminds you to continually test your assumptions. This episode is chock full of tips and ideas. I hope you enjoy! 4:50 The power Facebook Messenger & Messenger Bots: how some are seeing open rates as high as 95%. 7:55 Klaviyo’s visual flow builder: what it is and how you can accurately split test your email assumptions. 10:55 Worried you don’t have a big enough budget for effective Facebook & Instagram advertising? Here’s what you can do. 11:27 The one Facebook ads tactic that Andrew learned during the Intensive that is actually working for attendees. 12:51 How two of our attendees in the B2B space instantly started seeing a 7x & 3x ROAS on Facebook almost overnight. 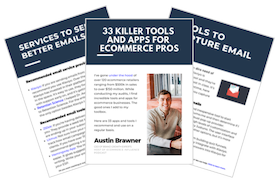 15:24 How this attendee used Gleam.io to run a giveaway that generated user testimonials, fans, purchases, and marketing materials & later saw huge success with their Kickstarter campaign. 17:39 Thinking of creating video content? Here is why you may only need your iPhone. 18:10 Still not sure how to social proof your Facebook ads? Andrew explains the value and exactly how to do it. 20:13 Are you on a Shopify site? Here’s why you should be running dynamic product ads as a part of your retargeting strategy. 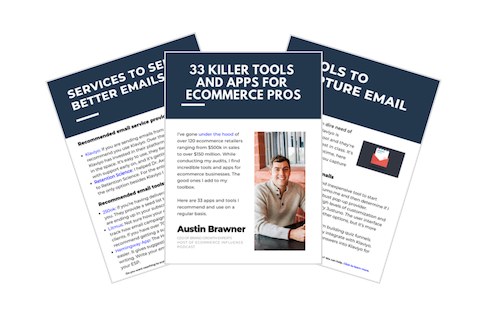 21:22 Email best practices and the one practice that Austin is surprised most ecommerce businesses are still not doing.